I got a few things for shoeboxes this week. We had some Rewards from Office Depot, so I scoped out their clearance. I was especially excited about the nice car. As I mentioned on my Facebook page, one of my uncles went home to heaven recently and he liked cars, so I decieded to make a box themed around things he liked, I found I already had a stuffed bulldog to add to it since he liked bulldogs. Also stocked up on some nice scissors at Mighty Dollar. Also a few cute other goodies. Sometimes I want to send something in a shoebox I pack for Samaritain's Purse's Operation Christmas Child, but have a hard time figuring out how to get it to fit in the box. So, I thought I'd share ideas and tips I've learned in this series of posts about making it fit. 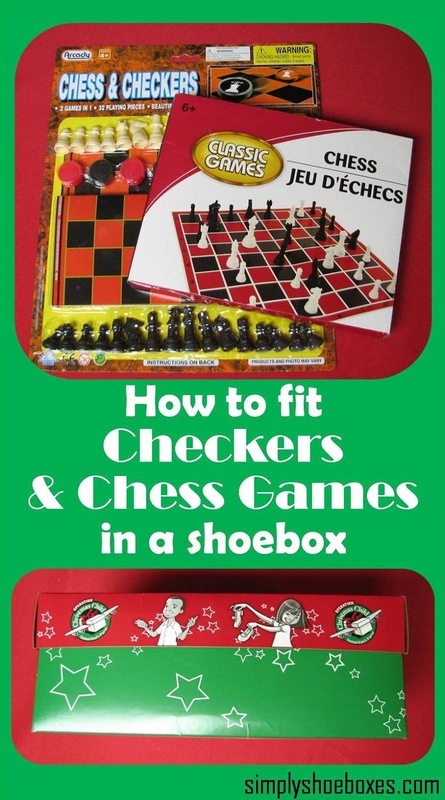 So today, I'll share about chess and/or checkers games. Sometimes you just can't fit them in standard shoeboxes depending on the board, and sometimes they come packaged in such a way you can just pop them in like this one from Dollar Tree (affiliate link). Or you can craft one from cloth, so it'd be soft and fit in just fine. 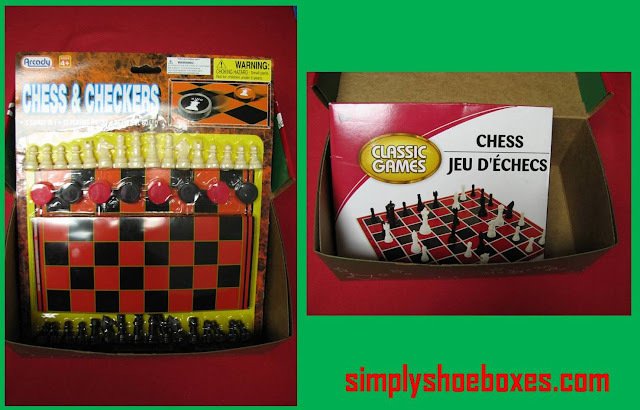 For others the board is folded and could fit easily in the box, but the packaging cannot. So first step is to get it out of the packaging, But we want to be sure no pieces are lost in packing, transit, processing, and the child unpacking. You also want to be sure they know they go together. A simple zippered plastic bag will wok, or for a more permanent option-a sewn bag is great! I'm currently hoping to find simple, illustrated instructions with minimal text of how to play both games to include when I send them. This post contained affiliate links and I will be compensated if you make a purchase after clicking on my links, this helps me afford the time to write this blog and keep up the Facebook page. It's baaaaack! The coupon on Dial Bar soap many of us like to use to get soap for Operation Christmas Child shoeboxes is available again. Also check this Sunday's newspaper, as the same coupon may be there as well! That works out to less than 20 cents a bar. Sometimes there is confusion with using printable coupons at some Dollar Trees. My suggestions are: print the coupons on normal quality, not fast draft (as I often do with coupons) to be sure they'll scan better, be ready to explain the small print of the coupon saying "off any 3 pack", and personally I always carry a printed copy of Dollar Tree's coupon policy. Of course, one should also be prepared to be polite and take no for an answer. Other people use the coupons at Walmart or another store. Some friends who iare planning a mission trip to Africa were selling some crafts to help fund it.. They donated some to us! Bags, scarves, and crayon and paper cases...with crayons and paper!!!! I really liked the feather fabric and I had already started a butterfly themed box this year, so that will be great. I was especially excited about the camera fabric as I'd gotten this camera journal a few years ago, and hadn't got it sent yet. I had also picked up a few things at Dollar General at 90% off Valentines.